It’s backyard barbecue seasonâ€•time to hang out with friends and family, play bocci or horseshoes, and indulge in lots of food and beverages. It’s summertime and that means outdoor parties. 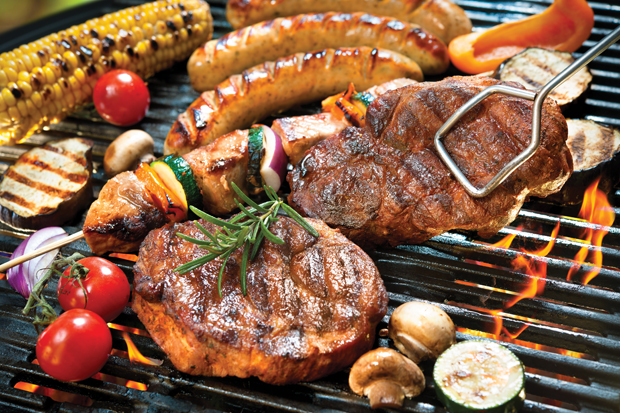 It’s often tough to make better food choices at a typical barbeque when surrounded by unhealthy options. An average plate at a cookout can easily set you back more than 2,000 calories – not real helpful considering barbeque season is also bikini season! It’s fine to splurge on occasion, but trying some of these healthy alternatives can save 1,000-1,500 calories at just that one meal. Take the focus off the meat. Instead think of adding color to your grilling. Grill carrots, red and green peppers, tomatoes, zucchini and yellow squash. Brush veggies with olive oil to keep them from drying out. Cooking actually boosts levels of antioxidants and phytochemicals in carrots and tomatoes. Processing and cooking make the carotenoids and lycopene more readily available. For the most nutrients select dark salad greens: Romaine lettuce, arugula, spinach, or chicory. Skip the iceburg lettuce. The key is to avoid high-fat salad dressings and cheese. One study found that people who ate three cups of low-fat salad before lunch, ended up eating 12 percent fewer calories the entire meal, than those skipping salad. A three-cup salad will provide three of the five to nine servings of produce you should eat daily. Build a leaner burger using lean ground beef or ground turkey. Lose the fatty beef, ribs and wings. Instead choose skinless chicken breasts, wild salmon, halibut or shrimp burgers. For the vegetarian, try a bean burger or a Portabello mushroom, which gives a hardy, beefy flavor without any of the fat. Skewer steak tips (grass fed beef) or chicken and offer a variety of sauces – BBQ, guacamole, or sriracha. Or use different seasonings like Mrs. Dash – it’s nutritious and delicious and easy to eat. Eating less meat and saturated fats will start the caloric savings. Dipping the skewered meats in sauces will still lend a satisfying taste but going light on the condiments results in saving calories as well as sodium. Skewer veggies and fruit like mushrooms, summer squash or pineapple. Add them to the skewers of meat or grill them solo. Enjoy kabobs. Small pieces of chicken, fish and lean beef cook faster and spend less time on the grill. Shorten grilling time by slightly precooking meat in the oven or microwave. Loose the full-fat macaroni salad, potato salad, coleslaw, and chips. Instead choose grilled corn on the cob, grilled sweet and white potatoes, or grilled veggies. Try healthier chip options like baked potato chips, vegetable chips, pita chips, or veggie crisps. Mayo, bacon, cheese, and special sauces quickly add unwanted calories. Iceburg lettuce, tomato and ketchup are boring! Build a healthier, heartier burger by topping off with avocado, spinach leaves, roasted peppers, grilled onions and mushrooms, and reduced-fat cheese. Replace the mayo with salsa or mustard – as spicy as you like it. Try a spinach wrap, an everything bagel, or whole wheat English muffin. Pita (or pocket) bread has only 70 – 80 calories and almost no fat compared to the average sandwich bun with its 200-300 calories. No matter how you wrap it, look for increased fiber with each serving. If you are watching your weight, lose half the bun. Don’t assume that a wine cooler is “light.” A 12-ounce bottle may contain more alcohol than a 12-ounce can of beer. It also contains 150-300 calories. Have a plan and make smart, intentional decisions about your choices. When you’re outdoors in the summer heat, be sure to hydrate with water. Cutting back, or skipping alcohol altogether keeps you hydrated longer and is a healthier option. To avoid alcohol, try nonalcoholic beers or wines. Grilled peaches, pineapple or mangoes make a truly healthy dessert. Freeze your own juice in an ice-pop mold or ice-cube tray, puree frozen fruit or freeze canned fruit and then puree. Frozen yogurt made from low-fat or nonfat milk is another refreshingly healthy option. 2. In a plastic bag, combine mushrooms, Balsamic vinegar and 1 tbsp olive oil. Seal bag until mushrooms are coated in the vinegar and oil. Let sit for a few minutes while preparing the other ingredients. 3. Heat a non-stick pan over medium heat. Add oil, let heat for 30 seconds, add onions, lower heat and cook, stirring often, until onions are soft and browned. 4. Remove mushrooms from bag and place on heated grill, round side up. Let cook for 2-3 minutes. 5. Slice tomato and wash greens. 6. Turn mushrooms, flat side up, top with goat cheese (1/2 oz each) and caramelized onions. Continue to cook for 3 more minutes. Remove from grill. 7. Serve on whole wheat buns. 1 serving = 1 burger, bun and toppings; 323.8 calories per serving. 2. Mix turkey, jerk seasoning, ¼ cup green onions, and panko into bowl. Add salt and pepper. 3. Form into four, 1-inch-thick patties. 4. Whisk mayo and chutney together in a large bowl. Add cabbage, carrots, and remaining green onions. Season with salt and pepper. Toss to coat. 5. Grill turkey patties until browned and cooked through, 4-5 minutes on each side. 6. Brush cut sides of buns with mayonnaise and sprinkle with jerk seasoning. Toast on the grill about 30 seconds. 7. Serve burgers topped with slaw and sliced avocado. 1 burger, bun and ¼ cup slaw = 375 calories. 1. Grind the oats in a food processor until grainy and sandy. 2. Place black beans in a bowl and mash with a fork (½ mashed and ½ intact). 3. Mix oat flour, squash, quinoa, corn, onion, garlic and olive oil into the bean bowl. Stir well to combine. Add spices. 4. Shape into patties. Cover baking grill basket with foil. Place burgers on grill basket. 5. Grill 10-12 minutes on each side. 1 Bean burger = 150 calories.